Yes, to bad they are useless because attack speed > speed, so will keep running with green anyway. Nothing changed. wait for that 30coin box u might be lucky there. But dont u people have alts? i guess that ancient transform is 100% good on some alts. Actually im gonna say that im a little bit disappointed and happy at the same time cuz I got my first AC transformation not by this event , but only by fusion it with the green ones. The post was edited 1 time, last by Psycho ( Jan 27th 2019, 1:07am ). great event so far. also made me play a bit more since i barely played in the last couple of months. 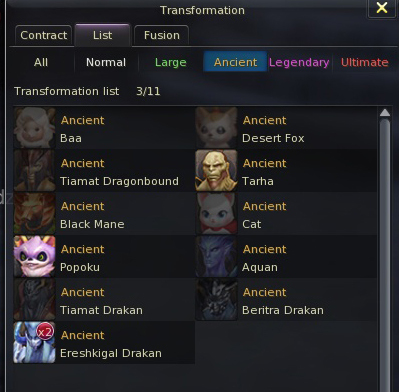 my main account got 4 ancient transforms, my alt account 0. such rng. i hope we get this event again in the future. what i don't like is the random skin parts we get, which is ugly anyway. still no 1 got legendary so far? im curious about it. So far i like this event. I don't know how many contracts i opened should be over 60. Got 1 ancient, not a direct effect to my main but it is still good. (Eresh dragon, my main is ranger.) Considering that i had a green shugo before, it is a cool update. In the meanwhile i also tried to fuse 6 greens 3 times, and of course they gave me again green. The worst part of this event is to those super unlucky ones who doesn't get a single ancient. I see many people has ancients anymore, so if you don't have any until now, you cannot even escape. But hopefully with also future events everyone will have ancients finally. Everybody can get an ancient with this last event, all u have to do is to pick up ur x2 coins daily on ur main char and when u have 30 exchange them for an ancient contract Idk if that contract is gonna give selectable or random ancient form though. But if its random, It means I can get double (even for now I have Tarha transformation). If I will get 2nd Tarha contract, then… im fu##ed up.